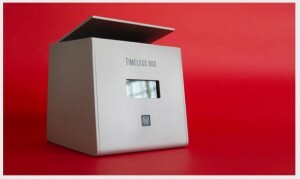 The idea of a time capsule certainly isn’t anything new, but it’s never looked quite as good as Timeless Box. For $100, you get a sleek aluminum (or titanium) box with a programmable time lock that can be set anywhere from 0 days to 365 days (or up to 10 years, if you have some extra cash to burn). You put something inside, lock it, gift it…and then you wait. And the giftee waits, wondering what’s inside, unable to open it until the countdown ends. Every time they see the Timeless Box, they are reminded that they have something to look forward to—a specially preserved unopened gift. If Apple made boxes, this is what they’d look like. Timeless Box is a unique idea with oodles of potential, but it hasn’t yet met its Indiegogo funding goal. You can back it and claim yours here. Or you can test a virtual version and send a future message to yourself or a friend.